The two victims killed at the car dealership were identified as Richard Smith, 53, and his son Tyler. The four people killed outside the restaurant were identified as 68-year-old Barbara Hawthorne and 74-year-old Dorothy Brown, all of Battle Creek.60-year-old Mary Jo Nye, and 62-year-old Mary Lou Nye of of Baroda. As details emerge about the night Jason Dalton allegedly gunned down six randomly chosen victims in and around Kalamazoo, Michigan — attacks apparently carried out over hours during which he also ferried passengers around town as an Uber driver — any hint as to why remains stubbornly elusive. A prosecutor said Monday that Dalton picked up fares for the ride-hailing service after the first shooting Saturday that left a woman seriously wounded and probably got more riders after the two subsequent shootings that proved fatal. But none of the shootings appeared to be connected to fares. Uber officials acknowledged the company received complaints about Dalton's erratic driving that day, and said company policy is to contact the driver when alerted to unsafe driving. But Uber would not say whether anyone at the company spoke to Dalton. Dalton, meanwhile, appeared briefly in court by video link and was charged with six counts of murder, which carry a mandatory life sentence. A judge denied bail for the 45-year-old former insurance adjuster, who Kalamazoo police Det. Cory Ghiringhelli told the court had admitted to investigators "that he took people's lives." 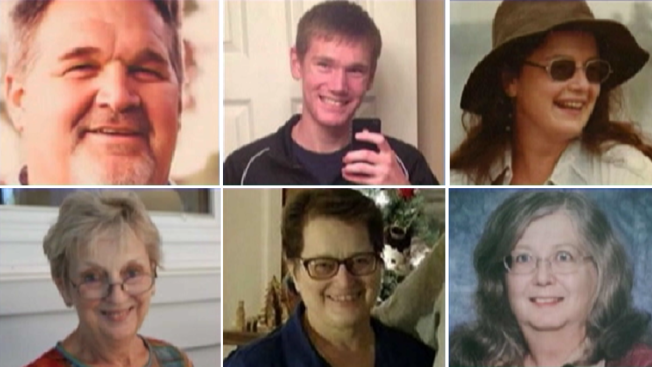 The admission seemed only to deepen the mystery of what was behind the killings of six people with no apparent connection to the gunman. Police and prosecutors acknowledge a motive may never be fully known. "This is a terrible moment in the community. We face violence like any other community does but nothing on this scale," said Kalamazoo County prosecutor Jeff Getting. "We've lost six people, we have a 14-year-old girl clinging to life, we have another victim who is recovering, thankfully ... we have a high school that's lost a classmate. "And no one understands why it happened." Matt Mellen told Kalamazoo television station WWMT that he hailed a ride around 4:30 p.m. Saturday. He said Dalton introduced himself as "Me-Me" and had a dog in the backseat. Kalamazoo County Sheriff Richard Fuller said Uber is cooperating with law enforcement officials, and he believes the company will "help us fill in some timeline gaps." Investigators are particularly interested in communication between Dalton and Uber, as well as customers he might have driven, the sheriff said. Uber said Dalton passed a background check and became a driver on Jan. 25. He had given about 100 rides, the company said. Saturday's attacks began outside the Meadows apartment complex on the eastern edge of Kalamazoo County, where 25-year-old Tiana Carruthers was shot multiple times but survived. Fuller said Carruthers sensed trouble when Dalton pulled up outside her apartment and put herself between his car and several children for whom she was caring, telling them to run to their nearby home. Getting, the prosecutor, dismissed the idea that Dalton was seeking a particular person at the complex. He said Dalton called Carruthers by a different name only "to get her attention" before opening fire. Fifteen minutes after that, five people were gunned down in the parking lot of a Cracker Barrel restaurant. Four of them died. Initial reports indicated that 14-year-old Abigail Kopf also was among the dead after being shot once in the head, but then she squeezed her mother's hand. She remained hospitalized in critical condition Monday night. Questions about motive and Dalton's frame of mind are "going to be the hardest to answer for anybody," Fuller said. "I have to say, 'You are probably correct.' I can't imagine what the answer would be that would let us go, 'OK, we understand now,'" the sheriff said.